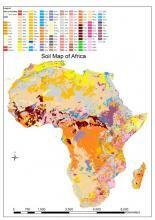 This GIS map (2013), present in the Soil Atlas of Africa, contains the dominant WRB Reference Soil Group and associated qualifiers (shapefile). The Soil Atlas of Africa supports the Global Soil Partnership of FAO and the final declaration of the Rio+20 meeting towards reversing and reducing global soil degradation. 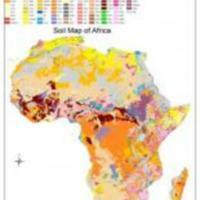 Global Soil Partnership, “Soil Atlas of Africa and its associated Soil Map (data),” Bibliothèque numérique de Racines-Sahel.org, consulté le 19 avril 2019, http://racines-sahel.org/bibliotheque-numerique/items/show/14.